Ek Chidiya Ne Band Karwaya Gutter Ka Dhakkan! Kya!?! Arre bhai… Sansani Vansani kuch nai. We, the poor ordinary mortals are getting deeply inspired by the Indian news channel hosts, who spew out criminally pretentious yet catchy dialogues, nineteen to the dozen to grab people’s attention. The ‘Chidiya’ in question is the twitter logo. 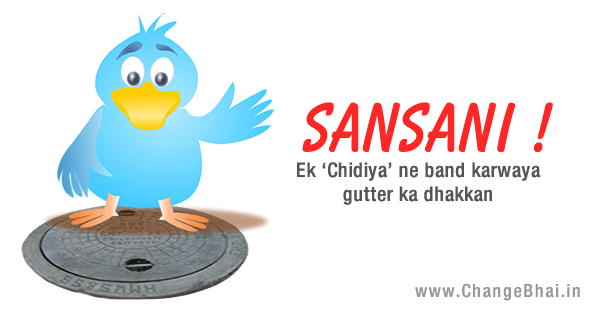 CHIDIYA = TWITTER. Matbal, an ‘open drain’ issue was resolved through twitter. Samjhe kya..Samjhe kya..
Raise a toast to the Ghatiya Logic pls. Karna padta hai yaar, interesting banane ke liye. Anyways, toh short mein, kahaani kuch iss prakar hai…. Toh, bacchon…batao…. ‘Chalaak Chidiya’ kahaani ka moral-of-the-story kya hai. Teacher…teacher….One should use social media for fun and keeping-in-touch, but kabhi kabaar aise acche kaam bhi kar lene chahiye. Do tag us on social media if you feel any similar issue around you needs attention.